Bop It! is a new take on a classic family game and the whole of the mellow household has been bitten by the bug - it's addictive! Bop It! by Hasbro is a hand-held game that can be played alone, or as a group. The Bop It! shouts instructions at you which you have to follow - miss an instruction and the game ends. It is a very simple challenge that gets you coming back time after time to try and beat your own high score. The classic game asks you to Twist-it, Pull-it and Bop It! but the brand new edition of Bop It! features even more fun instructions that have brought it bang up to date. The new edition of Bop It! features all the classic instructions plus lots of new ones - in the "action" mode the Bop It! will now ask you to Hammer-It, Saw-It, Comb-It, Golf-It, Cradle-It, Whip-It, Drink-It, Golf-It, Answer-It and Selfie-It! The Bop-It senses your movement of the device and will make sound effects to match your movement! 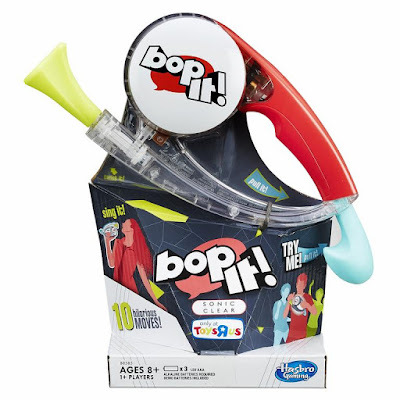 The better you get at the game, the faster the Bop It starts to issue you commands! If you miss an instruction, the Bop It! will make a sarcastic statement about your ability to follow instruction, or perform a motion. We have all found that it took a few hours of practice to master the movements that the Bop-It expects for each of the different actions. This put Lara off for a while as she didn't like the feeling of failure but we showed her how Mummy and Daddy do each motion and she has now been tempted back to give the Bop-It another go - she LOVES the classic mode though! If you're really up for a challenge you can play Bop-It without the verbal instructions. In beat-box mode you simply have to listen to the music and the sound effects and interpret which action to perform - it's phenomenally hard!!! We've enjoyed playing Bop-It in the garden, in the living room, even just one quick game before bed (in an attempt to beat that high score) but I also think it would be a fun game to play with friends, either children, or adults. In pass-it mode the Bop It! will randomly instruct you to pass the game to the next person for them to follow the next set of instructions - nobody wants to be the person who breaks the chain and misses an action! We've all enjoyed playing Bop It! - even Holly likes to give it a go. Look out for the new look Bop-It! with 10 different actions coming to a store near you soon!